While most Americans give positive ratings for how well the K-12 public schools teach reading, writing and mathematics, public assessments of STEM education for U.S. students in grades K-12 are middling. A large majority of Americans say such education is no better than average compared with other developed nations. Views of higher education in science, technology, engineering and math are a bit more positive, but there, too, only a minority of the public considers U.S. STEM education to be at least above average compared with other industrialized nations. 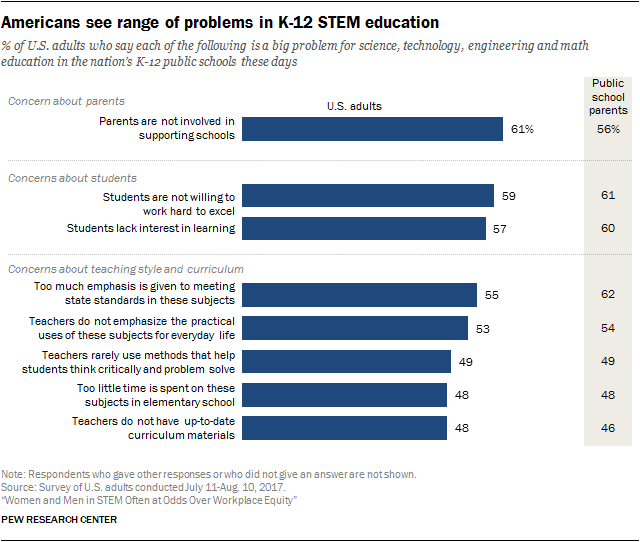 A majority of Americans say problems for K-12 STEM education can be attributed to limited parental involvement as well as failings in student work ethic and diminished interest in learning. But, at the same time, many adults believe such problems are the result of teaching methods and curriculum emphasis on meeting state standards. People with children in public schools generally give positive ratings of K-12 public education in their local community, as do Americans overall. Some seven-in-ten parents say local K-12 public schools do an excellent or good job teaching reading, writing and math (73%) and preparing students for college (70%). Smaller majorities of parents say local schools do an excellent or good job preparing students for technical careers (63%) and teaching critical-thinking and problem-solving skills (58%). Americans are generally lackluster about the overall education provided by K-12 public schools in the U.S. compared with other developed nations – and they are similarly critical of education in STEM. 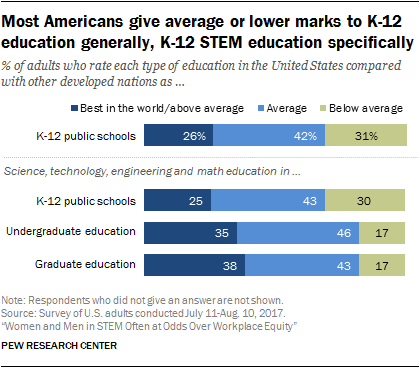 One-quarter of Americans (25%) say K-12 STEM education in the U.S. is the best in the world or above average compared with other developed countries, 43% say it is average and three-in-ten (30%) consider it below average relative to other nations. Parents of students in public schools give similar ratings; some 26% say STEM education in the K-12 schools is at least above average compared with other countries. These relatively low ratings of STEM education for primary and secondary students are broadly in keeping with a 2015 Pew Research Center survey, which used slightly different wording. Americans give somewhat better reviews to U.S. STEM education at the undergraduate and graduate levels, though, here too, fewer than half say that undergraduate STEM education (35%) or graduate education (38%) outrank that available in other developed nations. People holding a postgraduate degree, whether in a STEM or non-STEM field, are among the most likely to give high marks to the quality of postsecondary education in the U.S. About six-in-ten (62%) of those with a postgraduate degree in a STEM field say graduate education in STEM is at least above average, compared with one-third (33%) of those with some college or less education. Similarly, about half of those with a postgraduate degree in a STEM field (52%) see college-level STEM education as above average or better, compared with other nations. 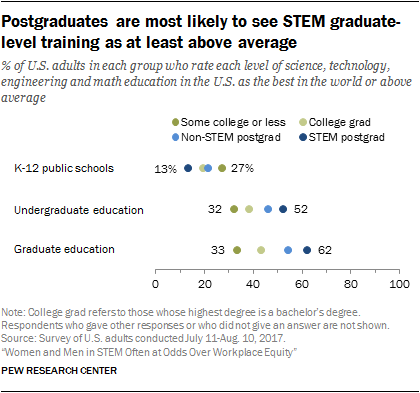 In contrast, just 13% of those with a STEM postgraduate degree rate K-12 STEM education as above average and about half (51%) say the U.S. is below average in this regard. By comparison, 27% of adults with some college or less education give K-12 STEM education in the U.S. the same rating. Americans spread the blame widely when it comes to problems with STEM education in K-12 public schools, with many seeing problems that originate from parents and students as well as teachers and school curricula. Most U.S. adults (61%) say it is a big problem for STEM education that parents are not involved in supporting schools. Similar shares say students’ lack of work ethic (59%) and lack of interest in learning (57%) is a big problem for K-12 STEM education. Similar shares of parents with children in public schools see each of these as big problems for STEM education. In all, 55% of Americans see emphasis on prepping students for standardized state tests as a big problem, while some 53% fault teachers for not emphasizing the practical uses of these subjects. Those who have a postgraduate degree in a STEM field tend to hold similar views about the problems facing K-12 STEM education. But, this group is especially likely to attribute flaws in such education to an underuse of teaching methods that promote critical thinking and problem solving (68% of those with a postgraduate-level STEM degree say this). When asked in an open-ended format which subject schools should emphasize more today, 28% of adults named a STEM subject. Specifically, 18% mentioned math or statistics, 9% mentioned science or engineering, and 3% mentioned computers or computer science. Other subjects mentioned include English (19%) and history or social studies (12%). 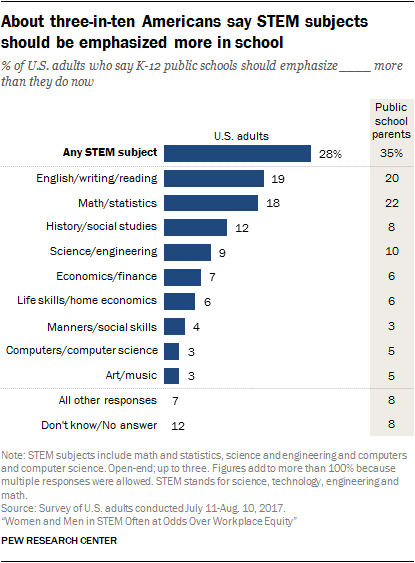 Parents with children in public schools are modestly more likely than all U.S. adults to name a STEM subject as needing more emphasis (35% vs. 28%, respectively). People with a postgraduate degree in a STEM field are particularly likely to volunteer that K-12 public schools should emphasize a STEM subject more than they do now – 42% say this, compared with 25% of those with some college or less education.